Financial crime can impact your businesses in a variety of ways, including credit card chargeback fraud, latency trading, and bonus abuse. You can choose a fraud detection tool that alerts you after a fraudulent transaction has occurred or one that raises flags before your company is a victim of a financial crime. Fraud databases, like DisputeWatch in the financial industry or Perseuss in the travel industry, are risk assessment tools that help you prevent fraud before it happens. Proactive tools like these can help with chargeback prevention by letting you avoid risky clients. In 2018 Thomson Reuters released a report on financial crime. It included data from over 2,300 executives and members of senior management at companies from 19 countries. Seventy-two percent of those surveyed said they reduce risk by avoiding risky customers. To discover whether any of your clients or potential clients present a high risk, you need access to more data about them. Shared fraud databases are key tools in preventing fraud and decreasing financial losses. Fraud databases allow you to compare your client list and customer transactions to fraud reports from other companies. However, for fraud databases to be effective, all the companies that use them must contribute information and be willing to share information. 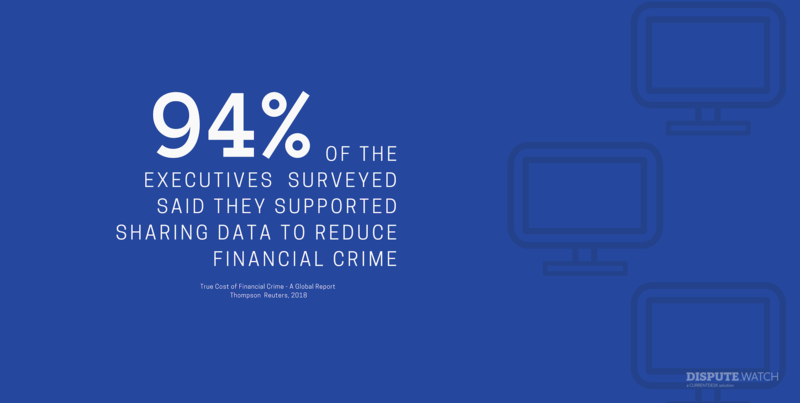 Ninety-four percent of the executives at the companies that Thomson Reuters surveyed said they supported sharing data to reduce financial crime. Because so many companies are open to the idea of sharing information to stop financial criminals, the practice is likely to increase in the future. Companies that begin sharing data now will have an advantage over those that wait because they will stop fraud more quickly. Many companies are hesitant to share their information or client lists with a third party. Although it is easy to understand that a company wants to protect its data and keep client lists private, there are many safeguards in place that should help reassure executives that your company’s data will be treated confidentially. The EU’s General Data Protection Regulation (GDPR) standards are one of those safeguards. CurrentDesk, which operates DisputeWatch, follows GDPR rules when dealing with all of our clients’ data. By following those rules, DisputeWatch remains compliant with legal requirements and helps ensure its own success. Whether you use DisputeWatch or another fraud tool, make sure you’re company complies with GDRP by informing clients that you’re sharing their data with a third party to run a fraud check. Any company that runs a fraud management system must treat data in the database as confidential in order to remain in business. If a company stole data or shared it improperly, clients would quickly stop working with them. A desire for long-term business success guarantees that fraud databases will behave ethically. Thomson Reuters’ research shows that nearly half of the respondents said their company had been the victim of a financial crime in the previous 12 months, with 69% reporting fraud and 75% reporting some kind of cybercrime. The report estimates businesses lose over $230 billion to fraud. Sharing your client list and details about financial crimes against your company can help you prevent fraud and other financial crimes from costing your business money. To learn more about joining DisputeWatch for free, visit the DisputeWatch website today.